Scarletville, Iowa, bills itself as a National Redhead Sanctuary. Indeed, it’s a town where the vast majority of the populace are redheads. A town where gingers are worshipped, and the redder the better. Where strawberry blondes are disparagingly referred to as “strawbies” and looked down on as “not red enough.” Where those who dye their hair to fit in are dubbed “arties” and outright ostracized for their false redness. It’s the town’s dirty little secret, that blondes and brunettes are shunned, mocked, discriminated, kept out of positions of importance. Felicity St. John is one of the reddest of the red, and a beauty queen in the making. Her mother, a former Miss Scarlet twenty-five years ago, has driven Felicity to compete all her life, with an eye towards making sure Felicity entered, and won, the Miss Scarlet pageant when she came of age. And now that time has come. But Felicity’s not so sure she wants to be a beauty queen, to follow in her mother’s footsteps, to bring home the trophy her mother has craved for so long. She’d rather take art classes and follow her own dreams. But with the pageant fast approaching, it’s time to play dutiful daughter a little longer. Only…there’s a problem. Someone has found out Felicity’s dark secret—that she’s dyed her hair ever since she was a toddler—and now they’re blackmailing her. If she gives in to their demands, it could ruin her social standing and her chances at Miss Scarlet. But if anyone finds out the truth, it could destroy her entire life. Caught between two impossible choices, can she find a way to break free? 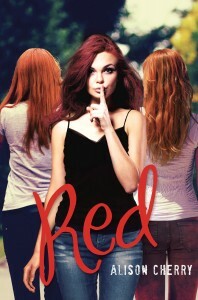 At first, I looked at Red as a relatively run-of-the-mill YA drama. You know, slice-of-life, with teen angst, romance, a protagonist forced to make hard decisions and come of age, the usual. And one set against a comparatively lightweight premise. A town full of redheads? Where the heroine’s deepest, darkest secret is that she’s not a natural redhead? Yeah, good for some laughs, but hard to take seriously. It reminded me of Emma Pillsbury’s parents from Glee, on a larger scale. Alison Cherry has taken all of the angst and emotional turmoil, all of the social upheaval and complexity, faced by minorities of every sort, and repackaged it with a cis white straight face. In the real world, a girl like Felicity, who’s beautiful, poised, confident, accomplished, in a steady relationship with a guy—in short, absolutely normal—would be accepted without reservation. Her hair color wouldn’t even be a factor. Only in this dysfunctional, intolerant, close-minded town of redhead supremacists would she be afraid of being destroyed by a single mistake. As we see throughout the course of the book, there are distinct and real disadvantages of being anything but a redhead. They’re shoved out of line, informally barred from competing in the Miss Scarlet pageant, shut out of many high school clubs and student body positions, and so on. The rage and frustration brought on by this treatment leads to Felicity’s blackmail experience, and while I can’t exactly approve of the tactic, I can understand where the perpetrator comes from. I’m honestly torn by this. On the one hand, I’m all about YA that encourages and features diversity, and this book has very little of it. On the other hand, the author tackles some pretty complex subjects in such a sideways, unexpected manner, that I pretty much have to tip my hat to her. It’s an unconventional method that manages to be both subtle and a little silly, and it works. Of course, all of these deep thoughts have distracted me from the other aspects of the story, so let me tackle them in brief. Felicity’s internal turmoil is relatable and believable, and watching her participate, however unwillingly, in the downward spiral of her own social standing, is painful and yet strangely refreshing. As she strips away the trappings she didn’t even want, you can see the real Felicity, the one her own domineering mother can’t recognize, come out at last. Couple that emotional journey and character growth with a sweet (if somewhat predictable) romance, and you have the makings of a story that would be perfectly enjoyable even without the deeper message. Oh, and can I just say, I’m a huge fan of Felicity’s friend Ivy, the athletic tomboy who enters the Miss Scarlet pageant against her better will, doing it just to help out her friends, and who then does everything in her own indomitable style? For the bathing suit portion, she wears her swim team one-piece, cap, goggles, and flip-flops. WIN. This is a surprisingly strong and satisfying debut for Alison Cherry, and I hope to see much more from her. She’s proven that she can deliver a sophisticated message in a deceptively innocuous wrapping, and I look forward to future offerings.